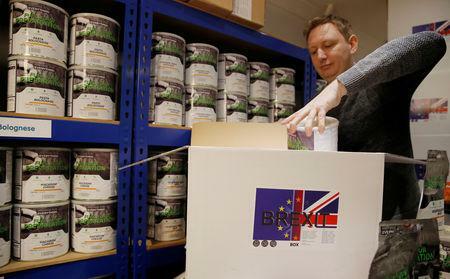 LEEDS (Reuters) - With just nine weeks to go until Britain is due to leave the European Union, a company is selling worried Britons a survival kit to help them prepare for the worst. With still no deal on how Britain will trade with the EU once it leaves, retailers and manufacturers have warned a "no-deal" Brexit could cause food and medicine shortages due to expected chaos at ports that could paralyze supply lines. 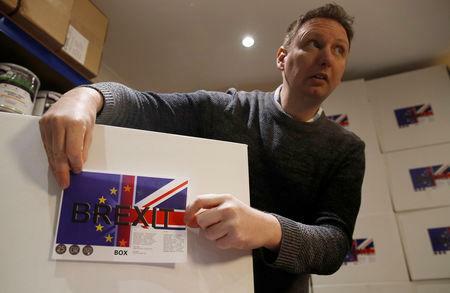 The Brexit Box includes 60 portions of freeze-dried British favorites: Chicken Tikka, Chilli Con Carne, Macaroni Cheese and Chicken Fajitas, 48 portions of dried mince and chicken, firelighter liquid and an emergency water filter.